This Ram 3500 delivers a Intercooled Turbo Diesel I-6 6.7 L/408 engine powering this Automatic transmission. WHEELS: 17" X 6" POLISHED ALUMINUM, TRANSMISSION: 6-SPEED AISIN HEAVY-DUTY AUTOMATIC -inc: 3.42 Rear Axle Ratio, Transmission Oil Cooler, TIRES: LT235/80R17E BSW ALL-SEASON. QUICK ORDER PACKAGE 28H LARAMIE -inc: Engine: 6.7L Cummins I-6 Turbo Diesel, Transmission: 6-Speed Aisin Heavy-Duty Automatic , SPORT APPEARANCE GROUP -inc: Black Power Fold Trailer Tow Mirrors w/Memory, Body-Colour Door Handles, Highline Door Trim Panel, Body-Colour Grille w/RAM, Black Exterior Mirrors, Painted Front Bumper, Painted Rear Bumper, Bifunc Projector Headlamps w/Black, Black Premium Taillamps, REMOTE START SYSTEM, POWER SUNROOF, POWER ADJUSTABLE PEDALS W/MEMORY -inc: Radio/Driver Seat/Mirrors/Pedals Memory, PEARL WHITE, MONOTONE PAINT APPLICATION, LED BED LIGHTING, KEYLESS ENTER 'N GO W/PUSH-START -inc: Remote Proximity Keyless Entry, IP-MOUNTED AUXILIARY SWITCHES. 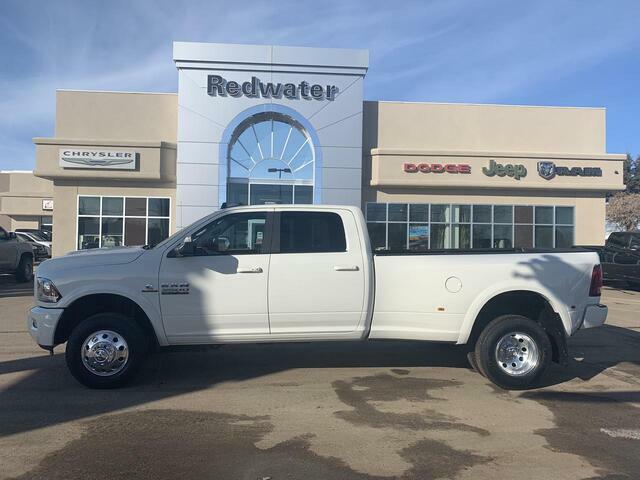 Test drive this must-see, must-drive, must-own beauty today at Redwater Dodge, 4716 48th Ave PO Box 407, Redwater, AB T0A 2W0.